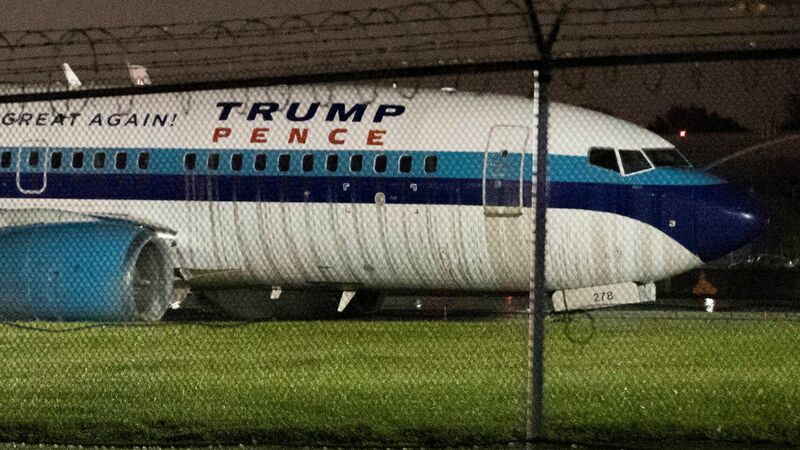 EAST ELMHURST, Queens -- A plane that overran a runway at LaGuardia Airport last month while carrying Republican then-vice presidential candidate Mike Pence "floated" nearly halfway down the 7,000-foot-long landing strip before touching down, the National Transportation Board said Tuesday. The pilots hit the brakes about four seconds after touchdown, and thrust reversers were deployed about seven seconds after touchdown, the NTSB said in an update of its ongoing investigation. No one was injured in the Oct. 27 incident. The Boeing 737 carrying Pence, 36 other passengers and 11 crew members landed in a rainstorm, slid sideways and came to a stop in a field of aerated concrete blocks called arrestor beds, which are designed to stop aircraft from barreling off runways. The blocks kept the jet from running onto a busy highway. The NTSB said the flight crew didn't report any mechanical irregularities. That was corroborated by the plane's flight data recorder. Flight crews of four planes that landed earlier didn't report any problems braking on the wet Runway 22. The airplane was manufactured in 1998 and had 48,179 flight hours and 17,098 flight cycles. It landed in New York on a flight from Fort Dodge, Iowa. A spokesman for Eastern Air Lines, which operated the charter flight, did not immediately comment. Pence, the governor of Indiana, and running mate Donald Trump won the presidential election a week and a half later.